I’ve heard it said before that every man walking this earth has tried to play guitar at one time or another. In my experience there are a lot of women out there fine-tuning there craft as well. Whether you are in the first category or the latter you are guaranteed to share one universal problem; pick thieves. Pick thieves can be actual evil people (I’m picturing something like the Hamburgler), our own absent mindedness, or even those greedy couch cushions. The fact is, at some point you are going to find yourself ready to impress the masses or battle to the death in a guitar duel just when you realize you're pickless! This is where the Pick Punch comes in. 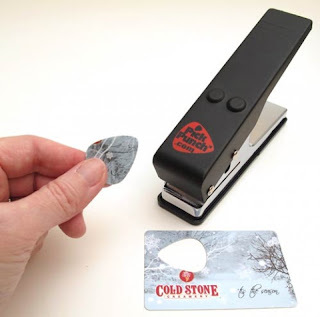 With the Pick Punch you’ve got a new pick waiting for you just about anywhere. Resembling a heavy-duty commercial stapler, it punches pick-shaped holes in depleted gift cards, old driver’s licenses, and even empty soda bottles. Von Luhmann, the creator of the product sent me his standard 351 Pick Punch and his new “jazz style” Pick Punch. I have to say I’ve had a blast seeing what these things will punch through. After all I do have to test its limits right? If you’re not as adventurous as me there are plenty of handy “how to” guides at www.pickpunch.com covering the do’s and don’t of making your own picks. A nice surprise to this little gem is the ability to customize the look of your picks with pictures, logos, etc. This is done by cutting two clear picks and gluing a picture in between the layers. Sometimes anything mass produced just can’t keep up with the niche trends of the trendsetting guitarist. Then again, maybe the fact that you rock no matter what your picks are made of is what you’re all about. No matter what your reason the Pick Punch is the tool to do it. There is no doubt that the Pick Punch does its job well but, it’s up to the individual to decide how often they will actually use this. It may be your answer to the down economy, having to never buy a pick again, or you might bring it out every now and then to impress a friend. At $25 it’s not a huge financial gamble, especially if you’ve been researching boutique pedals lately. Since a dozen picks will cost you around four dollars you will have to make around seventy-five picks before you make up your money. But the math doesn’t encompass the whole decision does it? It comes down to this. 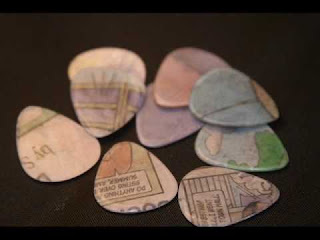 If the idea of customizing your own picks sounds cool to you then this is for you. However, if your simply trying to save money, just search the couch cushions or set a pick thief trap. I hear they like M&M’s. Mike,that was awesome to win a 1 year membership to your lessons,i watch you on you tube all the time .your website is way more detailed.anyways just for subscribing you cant beat it.also i see a big sale on your lessons,really great deal check it out you wont be disappointed.